Members of the P.E.I. 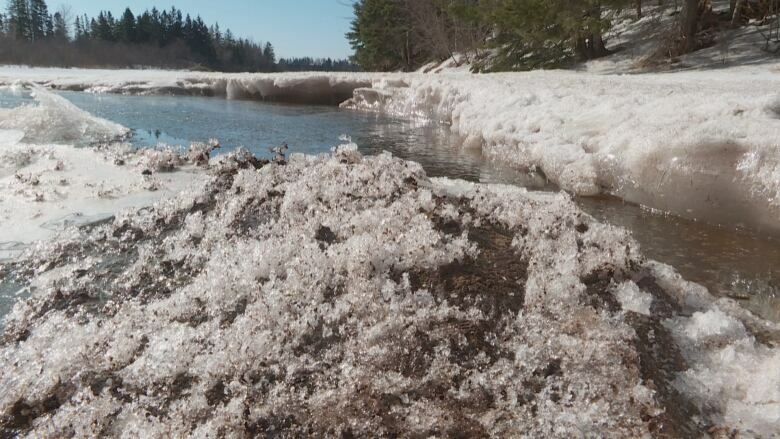 Shellfish Association have complained to provincial and federal environmental departments after finding peat moss flowing into the East Bideford River. The Department of Fisheries and Oceans is investigating peat moss in the East Bideford River after receiving complaints from members of the P.E.I. Shellfish Association. Kenneth Arsenault, president of the association, said members have noticed what appears to be peat moss in the river for several years, which they believe is coming from Northern Peat, a peat moss company in the area. Arsenault said last summer when he was on a boat on the river he saw about a metre of peat moss lying on the bottom. He said people in the shellfish industry are concerned about the peat moss choking out oyster spat — the small oysters that are seeded to grow in beds until they are adult-size oysters for harvest. "It's a big concern. The East Bideford River is the main source of oyster spat collection on P.E.I. and the P.E.I. Shellfish [Association's] mandate is to enhance public oyster beds on P.E.I. This is our source of oyster seed that we collect here," he said. According to Arsenault, yearly oyster seed collection by the association is typically within the millions. Last year, only about 20,000 seeds were collected. In a statement sent to CBC, Northern Peat's managing director Paul Daley said, "Northern Peat and its employees work closely with the Department of Fisheries and the P.E.I. Department of Environment to maintain and preserve a healthy environment." It went on to say that the peat moss plant "has always been in compliance with local and national regulations" and that "there is no data to support claims that oysters are impacted by peat moss." "Leading experts believe that peat moss may provide a unique environmental condition that is beneficial to oysters," Daley said in the statement. "Northern will continue to work with local government and surrounding communities to support a healthy, sustainable environment." The provincial Department of Environment said it was notified of Arsenault's complaints and handed the investigation over to DFO. In a statement to CBC, DFO said that fishery officers from its conservation and protection division went to the river Monday to collect samples and that an investigation is currently underway.